This is the Fort Purbrook ARC's photo albums page, where photos and accompanying text of both club and member activities are displayed for the interest and enjoyment of others. To view an album, please select one from the Table of Contents window below. To navigate an album, click on any of the thumbnails to enter the album. This will enlarge the photo to fit into its blue border. At the top are direction arrows to navigate backwards or forwards. Many can be further enlarged by clicking with the hand symbol. Alternatively it's worth scrolling down and seeing all of the photos in the album, which can also be individually selected. Finally to return to the Gallery Page at any point, just click on the Gallery tab and you can start to view another album. We hope that you enjoy the pictures. Welcome to Scott's Photo Album. Scott is Radio Operator on the Protector and operates with his Falklands callsign when he can. 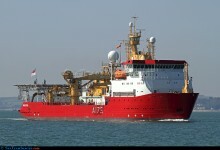 We hope to add more photos of Scott's activities in the South Atlantic in due course.